It’s a blustery Friday in September and the weekly lunchtime soup kitchen at St. George’s United Church in downtown Courtenay is just getting started. The church is busy—people coming, people going, and people hanging out, alone or in clusters, on the steps and the grassy lawn. These are the community’s down and out. The challenges they face are complex, as are the challenges they present to our society, which often can’t figure out what to do with such people. A warm meal, served up by friendly volunteers in a warm place, helps. 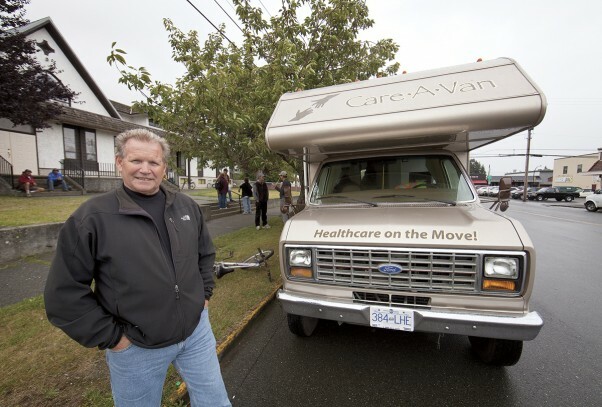 This is the Care-a-Van, a mobile medical clinic that travels around Courtenay, literally taking healthcare to the streets. It is the only one of its kind west of Calgary. Each week it has regular shifts at St. George’s, the Maple Pool Campground, the Washington Inn, and the shacks on Headquarters Road. In its customized, precisely-ordered interior, the Care-a-Van contains all the equipment a regular doctor’s office would have. 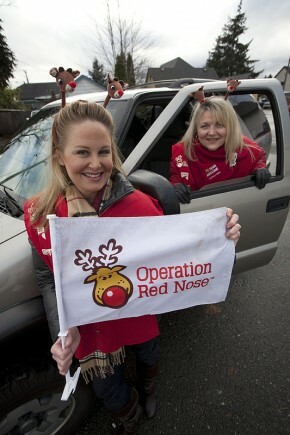 It’s staffed by a volunteer driver and two volunteer medical professionals, usually one doctor and one nurse. These staff provide not just medical care (including dental and eye care) but also warm clothes, referrals to helping agencies, links to housing, and a sympathetic ear. As Care-a-Van volunteers, they understand the complex realities of their clients’ lives. While changing a dressing or administering medication, they may be dispensing information or advice that gets that client set up with housing, a disability pension, education, or employment, setting them on a path to a more stable, independent life. The Care-a-Van costs only about $25,000 a year to run, and it saves the healthcare system hundreds of thousands of dollars by providing frontline care to the vulnerable, thus keeping them out of the emergency ward, which is where they otherwise tend to end up. The Care-a-Van is the most visible manifestation of Dawn to Dawn, a Comox Valley non-profit organization dedicated to eliminating homelessness in the Comox Valley. Less visible, but equally important to this goal, is Dawn to Dawn’s residential program. This provides homes for 17 people, all formerly homeless, along with independence planning support and programs to increase life skills, health and employability. Doctor Simon Colgan and the mobile Care-A-Van tend to patients who often fall through the cracks in the healthcare system. Dawn to Dawn owes its success to quite a number of dedicated people. One of the foremost of these is board member Tom Grant. This former business owner and current Comox Councilor was one of the driving forces behind the organization’s start-up. “In 2006, I served as the president of Comox Rotary Club,” Grant recalls. “Every year we’d raise tens of thousands of dollars and we’d give it away based on requests that came in. I wanted to be more proactive for my year. So we struck a committee to find out what the most pressing need was. Those committee members went out and did their research and came back and said it was drug addiction and homelessness. “So, in our naivety, we set aside $15,000 and said let’s do something about homelessness. Along the way, I got given the name of [Comox Valley nurse] Helen Boyd and was told that she knew a lot about homelessness,” says Grant. Once Boyd and Grant connected, things really got moving. “We got together for a cup of coffee on a hot Friday in April,” Grant says with a smile. By the end of that first meeting, they’d decided on their first step—to hold a public meeting about homelessness. The name Dawn to Dawn came from a homeless person who joined the board, and it expresses the intention of providing protection 24 hours a day. They soon found sympathetic landlords, who value having D2D as a reliable, long-term tenant they can rely on. Within months, D2D had seven two-bedroom apartments. D2D paid the rent and utilities, furnished the apartments (all through donations), found the tenants, helped them move in, and helped them find medical care, employment counseling, life skills training and other types of support. The apartments have housed 50 people since the first one opened in July 2008. One part-time coordinator, currently funded by the Vancouver Foundation, works with volunteers and keeps the program functioning effectively. Ideally, this housing marks a turning point for people, providing a springboard which helps them leave homelessness definitively behind. For many clients, the situation is made more challenging by mental health and addiction issues. In these cases, the stability provided by the housing, coupled with the support D2D offers, helps them get these issues under control, whether that means getting back on their meds, recovering their physical health, attending counseling, or learning about detox programs. In many cases, homelessness is as much a health issue as it is a housing issue, says Grant. It was that realization that led to the launch of D2D’s Care-A-Van. As it turned out, he could do a lot, explains Grant. “Three months later, he phoned us up and said he had a motorhome that meets our requirements. Not only that, his crew volunteered their time on weekends and evenings, and remodeled it according to our specifications—well, according to Helen’s,” says Grant, smiling. The Care-a-Van hit the streets in spring 2009 and very soon had a steady flow of clients. The Van’s clients tend to be the people who fall through the cracks in our healthcare system, notes Grant. “Many of these are what are called medical orphans—they don’t have a family doctor. Many doctor’s practices are full and the last thing they want to take on is a big problem,” he says. 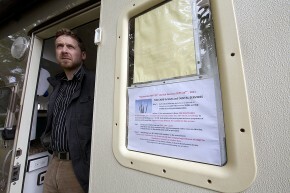 “And most homeless people are unlikely to go to a clinic or doctor’s office because it’s just not part of their world. They often feel shame, especially if they are drug addicts, and don’t want to expose themselves to judgment or interference from authorities. “Many of our clients are people who have no connection to the system at all, and don’t want to. A lot of them have mental health problems and are scared of everything and everyone. Furthermore, the Van provides a complexity of care that most doctors in clinics couldn’t begin to match. Not only does the staff provide information and referrals, they develop relationships with their clients and potential clients. Sometimes these relationships are the most valuable part of what happens in the Van. Grant illustrates this point with the story of a homeless man suffering from paranoid schizophrenia. “He wouldn’t talk to anyone. He wouldn’t come near us. Helen started leaving him boiled eggs. She started to gain his trust. Eventually she convinced him to come into the Care-a-Van and she took his blood pressure, which was way too high. And his diet was terrible. She got a mental health and addiction worker to come out of his office and meet the guy. Then she took the guy into their office and introduced him around. He started to feel comfortable. It’s these kinds of stories that keep Grant, and other D2D volunteers, motivated to be part of a project that sometimes rubs their noses in human misery. The biggest challenge facing Dawn to Dawn is finding a stable source of funding. Grant points out that other similar organizations, such as Our Place in Victoria, receive government funding. He is frustrated to see the City of Courtenay moving forward with plans to build an emergency homeless shelter, because based on his experience this is not the best use of public funds. He shakes his head ruefully and then changes the subject. Dawn to Dawn achieves plenty even with its limited budget, and that is what he most wants to talk about. “Let me tell you about our latest scheme: we put out a press release about a month ago saying we are looking for used RVs. We’ll give people a tax receipt for their donation. Rotary has offered to clean them up for us, and then we can give them out. We’ve got five so far,” he says. Another new project is a homeless soccer league, which started up in July, and plans are underway for a winter bowling league. These provide an opportunity to get moving, socialize, build self esteem, and focus on something beyond survival. It’s also an outreach opportunity for D2D: someone might come to soccer and learn about the Care-a-Van, then they might be placed in housing, and from there, they just might find their way to independence— thus helping Dawn to Dawn fulfill its goal of eradicating homelessness in the Comox Valley. For more information visit: www.dawntodawn.org. It’s a typical Friday afternoon at Prontissima Pasta in ‘Tintown’—otherwise known as Rosewall Crescent in Courtenay. Customers are browsing the products in the storefront coolers and shelves, lining up to get ingredients for the evening dinner. 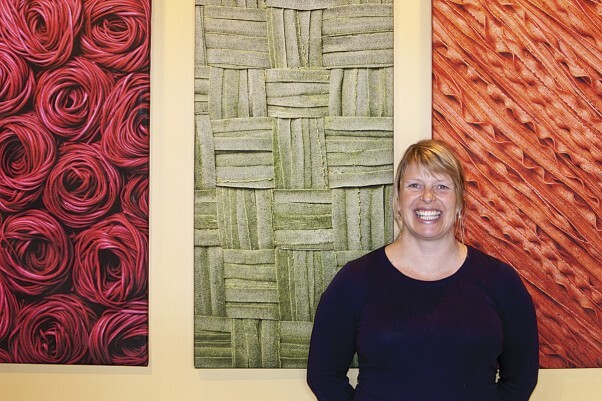 Proprietor Sarah Walsh is preparing for the Comox Valley Farmers’ Market on Saturday, but being a master at multi-tasking, manages to satisfy everyone with a full shopping basket and a whetted appetite. While the labeling continues, a couple of plumbers in the kitchen replacing a faucet seem to be getting distracted from their work as Walsh describes her products. Everything is natural with no preservatives. “We started with a traditional egg pasta,” continues Walsh, “then the Citrus Black Pepper, and the Chipotle and Lime, and the Spinach. The Spinach pasta has real spinach in it. A lot of fresh pasta will have dehydrated spinach powder, but ours, you can see the fibers of spinach. Walsh’s husband, Wally, also helps with the deliveries, though he has another job. “He’s really a carpenter!” she says with a laugh. Walsh’s career in pasta began as a result of the couple’s adventures traveling. After getting married in Canada in 2001, the couple sold their house in Dublin and headed to Spain to buy a sailboat. Their plan was to fulfill their dreams of traveling by sailboat and explore the different cultures and food of the Mediterranean. Three years into their sailing adventure, they pulled into one of the most historic ports in history; Venice, Italy. It was there that they fell in love with Italy and met friends Toni and Anna, who inspired them and planted the seed of passion for Italian food. In addition to teaching them the Italian language—they had arrived knowing only a few words—Toni and Anna also taught them many traditional family recipes and the art of making fresh pasta, “La pasta fresca”. 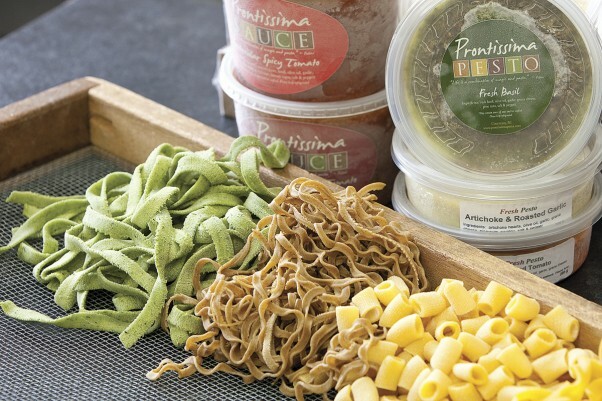 From their first lesson in Toni and Anna’s kitchen, they were convinced that fresh pasta was something special and delicious. A month later, their Venetian friends threw Walsh a birthday party and gifted her with her first fresh pasta machine.